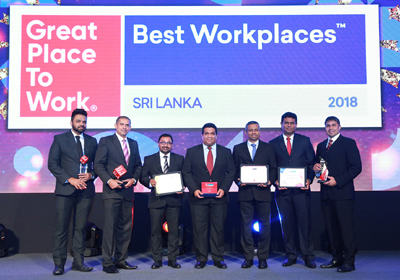 Colombo, 31st July 2018: DHL Express Sri Lanka has bagged a series of prestigious awards at Sri Lanka’s 25 Best Workplaces 2018 Awards Ceremony held recently by Great Place to Work® in Sri Lanka. This year‘s awards organised in partnership with Lanka Monthly Digest (LMD) and the Ceylon Chamber of Commerce presented the 25 Best Workplaces in Sri Lanka for the year 2018. 30,000 employees from over 115 companies representing 20 industry sectors were surveyed. This is the sixth consecutive study to be conducted in Sri Lanka. The scoring dimensions to select the Best 25 included credibility, respect, fairness, pride and camaraderie. DHL Sri Lanka won Gold for the Best Multinational Corporation and Best Medium Sized Enterprise Category. In addition to earning the mantle of being listed among the Best 25, DHL Express Sri Lanka was recognised among special category awards for excellence in specific areas of people management – factors that contribute to the overarching goal of instilling a great workplace culture in Sri Lanka. DHL Sri Lanka received the Gold Award for the Best Multinational Corporation and Gold Award for the Best Medium Sized Enterprise Category. The company also received special recognition as a great workplace which inculcates a high level of trust, establishing a solid foundation of credibility within the organization and was presented the Cube Award for the Best Organization in ‘Trust’. The company was also recognised for encouraging employee collaboration and was awarded the Best Organization in ‘Employee Collaboration’. Earning further distinction, DHL’s local listing in the 25 Best Workplaces in Sri Lanka contributed towards the company winning another prestigious regional award – the Best Multinational Workplaces in Asia. With the aim of becoming the Employer of Choice, DHL Sri Lanka has implemented various programs to create an environment that engages employees, enabling them to deliver excellence in their roles. This facilitates superior business performance and a real competitive advantage for the company. “We are delighted to receive recognition for our commitment to fostering a positive working environment, developing our employees and helping them to reach their fullest potential. The leadership team at DHL Express Sri Lanka understands that motivated employees are engaged and are able to constantly drive productivity and efficiency in the organization. It is truly rewarding to know that our people strategy has made a positive impact on our employees and to the success of our organization,” said Tharaka De Silva, Head of Human Resources, DHL Express Sri Lanka. Great Place To Work® Institute is a pioneer in studying and recognizing great workplaces around the world. For three decades in over 58 countries, the institute has conducted studies to understand and recognize the best workplaces. The Sri Lankan study is based on the global model and a rigorous methodology, which has been researched, tested and carried out in similar studies around the world – including in the Americas, Europe and Asia.